As you can see, we’ve put a custom skin on the units, which are otherwise an unremarkable gray color. This entry was posted in Uncategorized and tagged Baruch College, Laptops, Newman Library, Self-checkout by Stephen Francoeur. Bookmark the permalink. Anyway, I have a few random questions I thought of after reading your post. Forgive me if any are inappropriate! 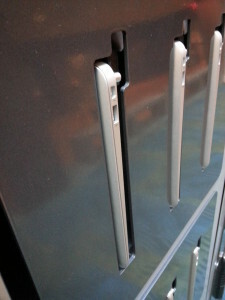 What security measures do you take to make sure the kiosk is not vandalized? Our library is open 24-hours during peak periods although the service points are locked down, is this kiosk mobile and/or does it come with some sort of security ‘cover’? What happens if kiosk breaks? Do you have staff trained and ready to go? Due to the short loan period of our laptops we have a high circulation rate and may not be able to pull staff ‘on the fly’ to jump in until the unit can be brought back up, that’s a concern. If the kiosk needs servicing are the service folk local? Who can borrow a laptop? I assume guest/visitors cannot? 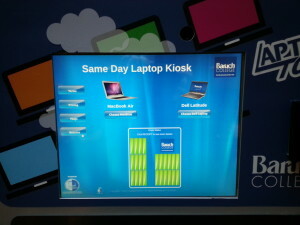 What if- say an instructor- wishes to loan a laptop longer than the kiosk allows? You say that laptops can be checked out for entire day- So theoretically a patron could borrow a laptop for 17 hours? Are laptops due back by close? Can patrons check them out overnight? Have you ever gotten the excuse- “Hey man, I returned the laptop! Put it in this slot right here yesterday!” when in fact the laptop was either never returned or not seated correctly in the kiosk, resulting in theft? Hi Stephen. I remember meeting you in Tallahassee a few years ago at the zoo. Since it’s only been a week since we turned the kiosk on and since I am not involved in any way in managing the service, I don’t know how many of your questions I can answer, but you can reach out to Edwin Melendez at the Baruch Computing and Technology Center for info on the kiosk itself (hardware/software questions) and to Monique Prince, our head of access services, for info on our laptop loan program generally and how this new kiosk service fits in with it. To get more context about the kiosk, you may want to look at our overall technology lending services in detail on this page of the library site. Regarding security, you should know that the kiosk less than 50 feet from the security guard’s desk at the entrance to the library. 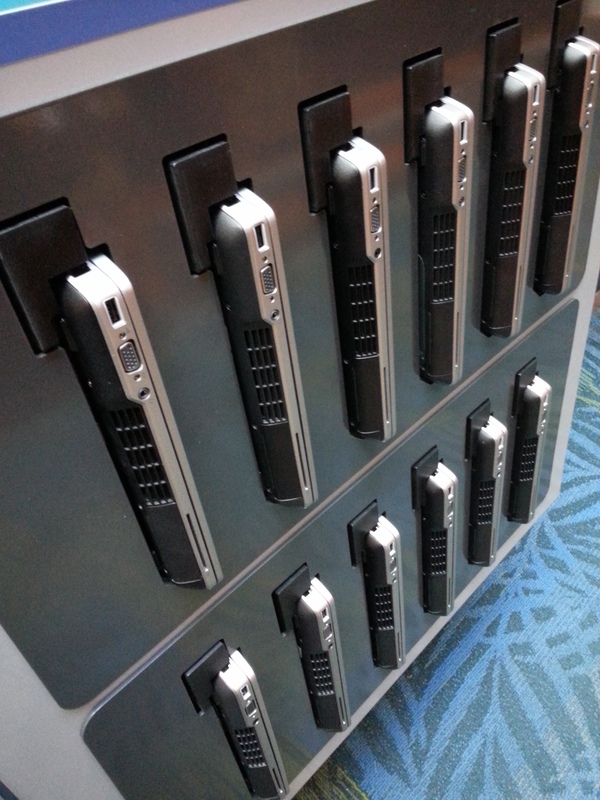 The laptops themselves are locked in and won’t come out until you are done with the checkout process. I don’t think there is any way to put a cover on it to lock it down entirely (maybe you could get in touch with the manufacturer, LaptopsAnytime, about that). We’ll soon find out what happens when the library is open 24 hours a day, as finals week will soon be here and our library will open around the clock then. Staff from the Baruch Computing and Technology Center are in the library much of the time that it is open and are keeping a close eye on it. I don’t know if the kiosk is also (or can be) remotely monitored in case the kiosk goes down. The number of laptops available at the kiosk is a small fraction of the total number we loan out (there are roughly 325 others that we loan out from a separate desk on the 3rd floor of the library). So if the kiosk is inoperable, we still have the desk to serve students from. I suspect that the kiosk, which is just a pilot project right now, will help cut down on the line at that desk and offer a measure of convenience that our students will find appealing. I don’t know if the screen on the kiosk indicates a low battery level on any unit; it does indicate when a unit has been reported as having a problem and is no longer available for checkout until it can be serviced. I think that if battery level is below a certain percentage then that unit can’t be checked out (but I’m not 100% sure about that). I don’t know how many students are going to bother getting a charger as well, as that would mean trooping up one flight to the third floor. I don’t know how many chargers they have on hand at the desk but I suppose they could always buy more if demand outstrips supply. 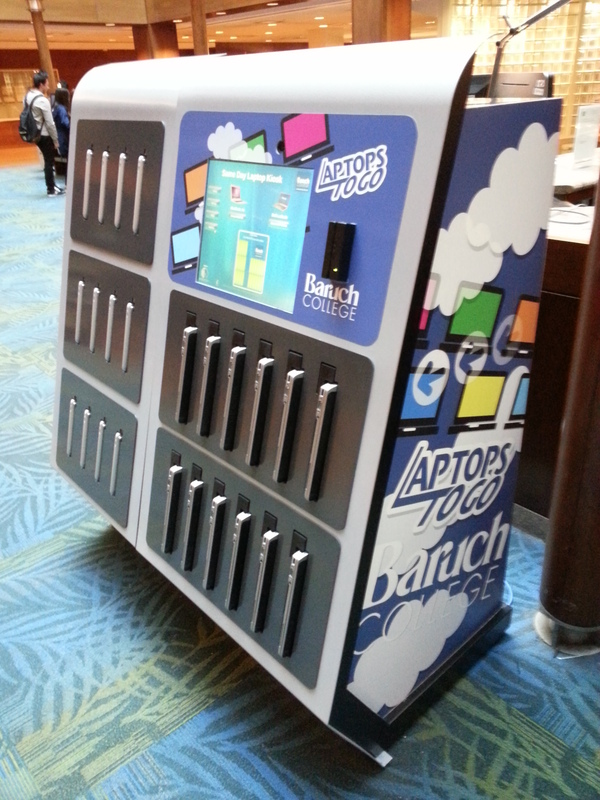 The only people that can borrow the laptops are Baruch students. 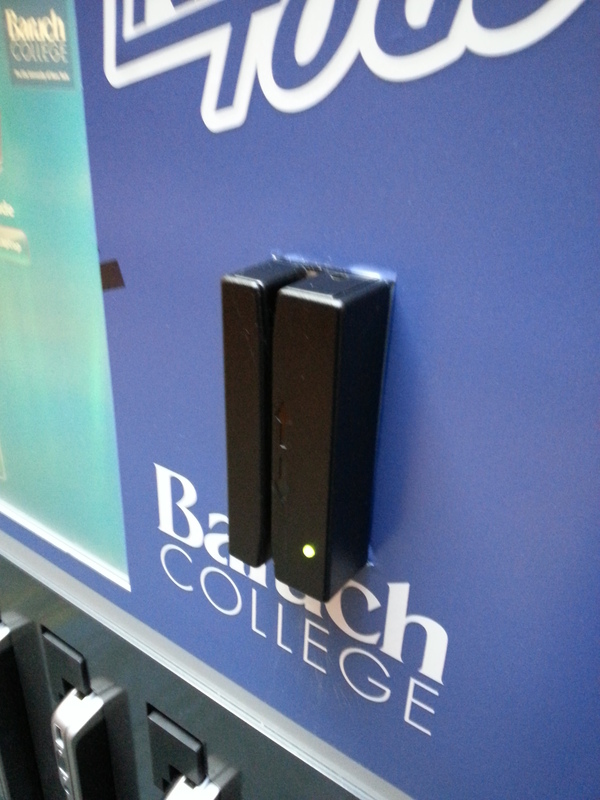 There are a small number of laptops elsewhere that Baruch faculty can borrow. Yes, a patron could check out a laptop for 17 hours, and that’s fine by us as long as it is back by midnight. I’m not quite sure how the loan period will work during the period when we’re open 24 hours, though. The head of access services would know that detail. Regarding excuses from students about late returns, I’d also direct you to our head of access services. I don’t think we’ve had the system long enough for this to come up yet. That’s about all I know about this brand new service. I think we’ll know a lot more in a few months. Here is a picture I took that shows all four icons.